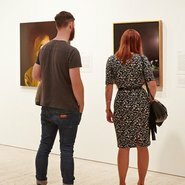 Join your fellow members of the Art Gallery Society of NSW for a morning touring some of Sydney’s best commercial galleries. View the latest exhibitions, with tours conducted by gallery owners and artists. Morning tea will be available in the Gallery from 9.30am prior to the bus departure at 10am. All tours depart from the Art Gallery of NSW front steps. Some walking and climbing of stairs may be required.